Edge recoveries are a set of moves that can be executed while a character is hanging on an edge. Along with grabbing the edge, these moves typically give a character invincibility frames to aid in recovery. It is often prudent to return to the stage before the invincibility frames expire. Edge recovery maneuvers are sometimes used to edge-guard, especially when releasing and re-grabbing the ledge to refresh midair jumps. Edge recovery moves also sometimes play a role in stalling. There are five general recovery moves which may be performed while grabbing the edge. 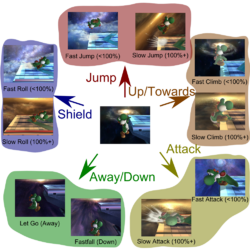 Each technique generally becomes slower and/or more powerful at damage percentages equal to or greater than 100%, with the exception of letting go/fast falling off the edge; this distinction has been removed in Super Smash Bros. 4. Climb: By pushing the control stick towards the edge, the character will climb up onto the stage. When the character has 100% damage or more, the action of climbing back to the stage is significantly slower. Attack: By pressing an attack button, a character will climb up onto the stage while performing an edge attack. This is primarily useful when the opponent is next to the edge, as a counter attack. When the character has 100% damage or more, the getting up to attack motion is significantly slower. On the plus side however, almost all edge attacks deal more damage (except for Captain Falcon's) and the character still has invincibility frames when hitboxes come out, unlike with the normal edge attack. Roll: By pressing a shield button, a character will climb up and roll forward a moderate distance. When the character has at least 100% damage, the action of getting back up to roll is significantly slower, however the roll itself covers slightly more distance. Jump: By pressing a jump button or pushing the analog stick up, a character will leap upwards and slightly forward. However, this move does not give a character invincibility frames. This option is not available in the first Super Smash Bros., and in Brawl, characters typically jump higher than they did in Melee, and have less ending lag on the jump, allowing them to perform other actions sooner, making it overall more useful. When the character has at least 100% damage, there is slight delay before the character jumps, though this increase in start-up lag is much less severe than with the other edge options over 100%. In Melee, this is sometimes sarcastically referred to as the tournament winner, due to its punishability. Let go (away): By pressing the control stick away from an edge, a character will let go or leap away from the stage. Pressing the control stick away and jumping at the same time has the same effect of performing a reverse midair jump in place. Depending on the character, following the release with a double jump and then an aerial attack can be faster than using the edge attack. 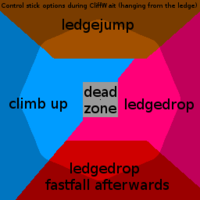 This is especially useful in Smash 64, wherein ledge jumps do not exist, as it allows a pseudo-ledge jump that opens new recovery and attack options (such as Captain Falcon and Pikachu planking with up aerials). Some characters have other benefits from double jumping after releasing the edge, such as Yoshi, whose double jump gives him armor. Let go (down): By pressing the stick down, a character will let go and fall downward. Tapping the control stick down will cause the character to fast-fall. Some common applications for this include mindgames with the opponent and planking. Options that can be triggered with the control stick when hanging on the righthand ledge. Sorted by priority. For example, pressing A and R at the same frame will result in an edge attack. Attack: Press A, B, Z or move the C-stick upwards. Roll: Press L, R or move the C-Stick towards the stage. Jump: Press X, Y or move the control stick upwards. Climb: Control stick up / towards (for all possible value combinations, see the image on the right). Let go: Control stick down / away (for all possible value combinations, see the image on the right) or C-stick away or down. This page was last edited on April 10, 2017, at 15:30.